BitLife – Life Simulator – How To Become Fire Chief? The answer to this question is you need to get into the fire department career to become Fire Chief. You will have to apply for the Firefighter job in one of the Fire Departments in your city and work hard there for a few years to get the promotion to the next posts. Here’s the timeline -> Firefighter -> Fire Equipment Operator -> Lieutenant -> Captain -> Battalion Chief -> Assistant Chief -> Fire Chief. Becoming a Fire Chief in BitLife is one of the 63 challenges. There are a number of things you need to take care of to accomplish this post. 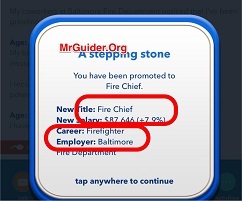 So, let’s get started – Bitlife – Life Simulator walkthrough tutorial to become a Fire Chief. ⇒The very first tip we would mention here is you have to start wisely. As you know that the game grants random looks, happiness, health, and smartness to the character. Before you progress, must check the virtual character’s stats. We would strongly recommend you to continue with the character having good stats(over 85 in all the three departments; happiness, smartness, health). If the character is unhappy, unhealthy, and dumb, start a new random life. ⇒While studying in high school, you should meditate and visit the library every year. At the age of 18, the virtual character gets graduated from high school. After that, the game will ask you to choose a subject and seek education in university/college. The second option you get is “College is not for me”. We would recommend you to choose the second choice(College is not for me). After that, tap the occupation button -> apply for the community college. After graduating from the community college, the game will advise you to look for a job or seek higher education. Go back to the education menu -> university -> apply for the university. We would recommend you to choose subjects like Engineering, Education rather than entertainment subjects(i.e. Music, Dance). In the third phase of your life(when you graduate from the university), the game will prompt you to look for a job. 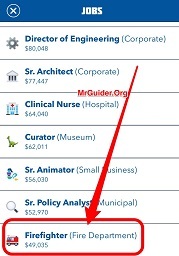 Go to the jobs menu -> here you can find all the job listings. Find the Firefighter job(Or Probationary Firefighter) and apply for it. Keep in mind that Firefighter Job is the rare one and does not appear right after graduation(if you are lucky, you may get). If the Firefighter job is not available, progress to the next year. Every year, job listings get changed. So make sure to browse the job listings every year. Meanwhile, you can work as a Factory Worker. Make sure to check the job listings every year. The Firefighter job appears eventually as you progress. 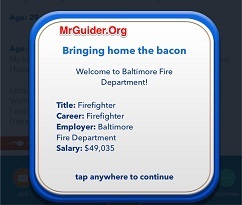 While working as a Firefighter, make sure to work hard every year to get noticed in the Fire Department(tap the job button -> work harder). As you progress to next years, you will get promoted to upper-level posts and eventually become the Fire Chief. So this is the complete walkthrough guide to become Fire Chief in BitLife – Life Simulator. If you know any other way to become Fire Chief in BitLife, make sure to share in the comment section below!